Christine Benlafquih. The Spruce Eats, 2010. Khlea (also called khlii) is a type of Moroccan preserved meat or jerky, usually made from beef. The meat is cut into strips, marinated with cumin, coriander, and garlic, and then dried in the sun before it's cooked in a mixture of animal fat, oil, and water. Once cooled, the meat will keep for up to two years at room temperature when packed in the cooking fat. In the days before refrigerators were common household appliances, preserving meat served a practical purpose. Some rural families still rely on khlea for storing meat, and they're the most likely to make khlea in large quantities annually. Other Moroccans purchase khlea merely because they enjoy the unique flavor it imparts to traditional Moroccan dishes, and rotate it into their diets along with other meats, poultry, and fish. Like other dried meats and jerky, khlii tends to be tough in texture. To counter this, cut it into small bite-size pieces when serving it with eggs or other quickly cooked dishes. If adding it as a filling for pieces of bread or pan-fried dough, such as meloui with khlii, finely chop it. The khlii will tenderize a bit when subjected to additional cooking, as is the case when it's added to stews or couscous preparations. For this purpose, you can cut it into large bite-size pieces and add it with other ingredients at the beginning of cooking. 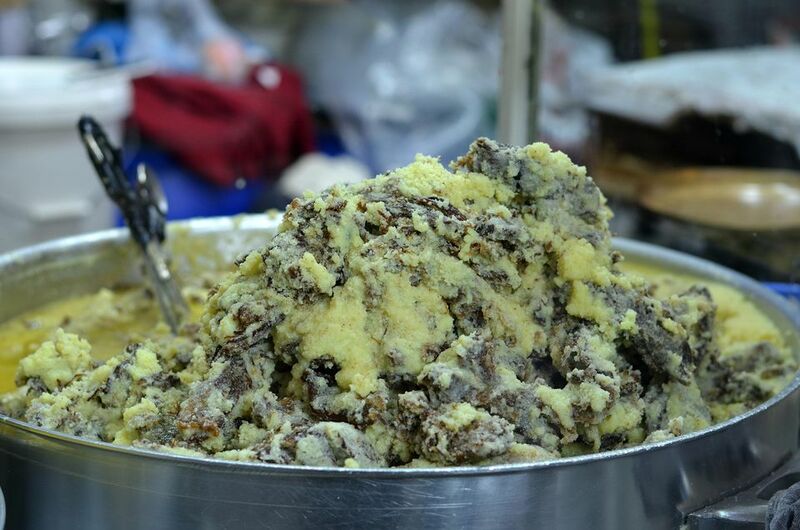 Most Moroccans will also cook with the fat in which the khlea is stored, even after all the meat has been used. The fat can replace butter or oil in sauteed or pan-fried recipes; it can also replace oils normally added for stewing meats, beans or vegetables; and it can be used to add flavor to rice, breads, and rghaif.